As you can see from the sign on the side of this hotdog cart. 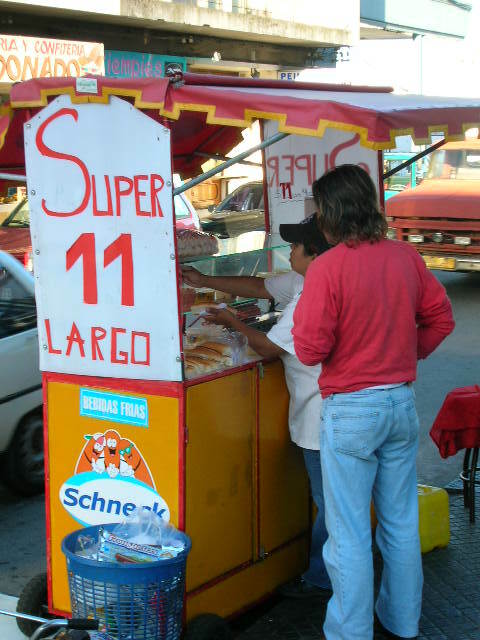 The price for a large hotdog is 11 Uruguayan pesos or approximately $.50 CAD. One thing that you will notice when you are buying a hotdog in Uruguay is taht they have a larger selection of topics that are typical to the people of Uruguay as opposed to what tourists from North America would be used to. You can choose from the regular toppings of ketchup, mustard, mayonaise and relish, or spice it up with toppings including onions, sweet and hot peppers, corn and even order a hotdog covered in Melted Mozarella Cheese. Do you have some favourite Pictures or Videos of Uruguay to share with our readers? 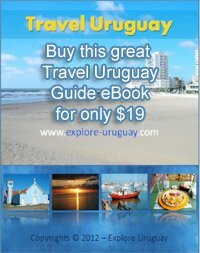 Explore Uruguay is always looking for pictures, videos, reviews, written contributions and additional information about Uruguay to share with our readers. Are Interested in making a submission? We Welcome you to make a submission by Clicking here or continue to Explore Uruguay with me.